Reflexology is an ancient practice that aims to keep the body balanced. It is based on the theory that all organs, glands, muscles, and the skeletal system can be stimulated via points on the feet, hands, and outer ears. The pathways between these pressure points and other parts of the body are connected via the nervous system. 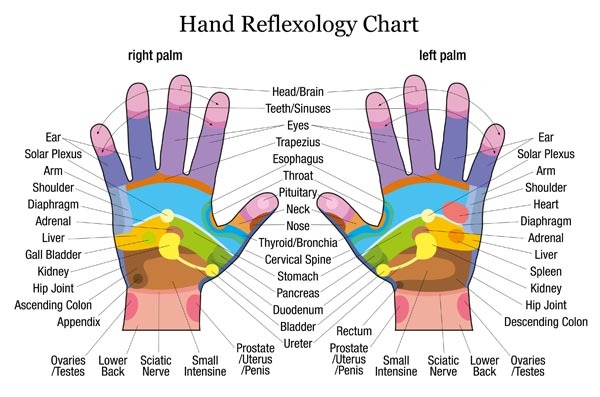 During a reflexology session, your massage therapist applies pressure to the feet, hands, and outer ears using specific thumb, finger, and hand techniques. Traditionally, reflexology is a dry practice, although when incorporated into a massage it can be done with oil or lotion. What is the difference between Massage and Reflexology? Massage therapists work “from the outside in,” manipulating specific muscle groups or fascia to release tension. In contrast, a reflexologist works “from the inside out” by stimulating the nervous system to release tension. When reflexology is incorporated into your massage, you are able to address the inside and the outside in one session. Combining reflexology and massage can achieve even more positive results for your clients. Reflexology works with the central nervous system. The application of pressure to “reflex points” sends a calming message through the nervous system, which in turn signals the body to adjust the tension level. This helps with relaxation by bringing internal organs to a state of optimal functioning, and also increases blood supply. It positively affects the circulatory, respiratory, endocrine, immune, and neuropeptide systems in the body. Another reflexology concept is based on the belief that there is an “energy” or “qi” in the human body. Prolonged periods of stress are believed to fester in the body, causing a congestion of energy that leads to vulnerability to illness. According to this theory, reflexology helps keep the energy flowing, thereby maintaining strong immunity. 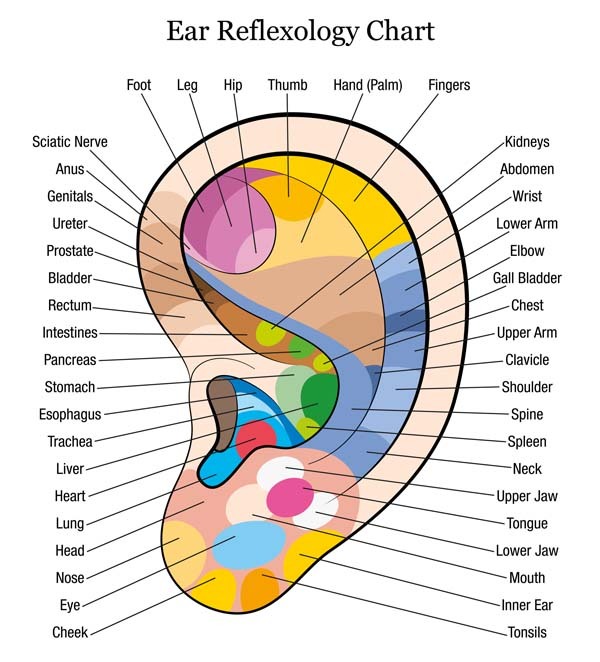 The basic theory behind reflexology is that the whole body can be mapped out on the feet, hand, or ears, with different “reflex points” that correspond to their respective areas of the body. By understanding how to read these maps, you can help achieve relaxation, improve circulation, and contribute to a general feeling of wellness. By working on these points with finger and thumb techniques, there is an indirect stimulation to that part of the body. This encourages the body to rebalance that part by releasing tension or making it more active if it is sluggish. There are 5 main techniques used when applying reflexology. Thumb Walking – Using only the top section of your thumb from the joint to the tip, inch your finger along the foot or hand, pressing into the foot then rocking your thumb back a little bit, inching it forward. Keep pressure the entire movement for the best result. Rotation on a Point – Great to use along the diaphragm line, just under the metatarsals heads. Press in with your thumb, then rotate the foot with your other hand. Inch along the diaphragm line repeating all the way across the foot. Finger Walking – Best used on the top or sides of the foot in more sensitive areas. Use the same technique as thumb walking, but use your index finger instead. Inch it along in between the metatarsals. Hook and Backup – Great to use on the spleen reflex and gall bladder reflex. Simply press the tip or your thumb directly into the point, then slowly back it straight out. Can be very deep, so be sure to check in with your client about the pressure. Slide and Press – Place both thumbs on the heel and slide each thumb from the center of the sole to the edge of the foot. Alternate the thumbs by using the right and then the left as you work up the foot towards the toes. When using these techniques, make sure to apply pressure in a gentle manner and avoid digging right into the tender point. Pressing firmly yet gently is the key to good reflexology technique. The sciatic nerve reflex comes down behind the right ankle on the lateral side of the leg, sweeps all the way across the heel and back up on the medial side of the leg. Using the thumb walking technique, start on the anterior side of the lateral ankle down towards the heel, continue all the way across the heel, then back up on the medial side of the leg on the anterior side of the ankle. To treat for shoulder pain, find on the foot the part of the spine that is level with the shoulders (from bottom of big toe to where the ball of the foot finishes), locate the part of the spine that is level with the shoulder area (from the base of big toe to where ball of foot finishes), thumb walk this part of the spine area up and down for several minutes, and then thumb walk the entire shoulder area. This is great for any kind of congestion and often helps immediately, you can even do it on yourself. Press and rub from the base of each finger to the tip. If you’re congested, your fingers might feel a little tight or puffy as you get to the tips. Do this on each finger on both hands a few times, 3 or 4 times a day, or as needed. On the hand, the spine reflex is located from the tip of the thumb, along the outside of the of the hand down to the wrist. Thumb walk the outside of the thumb down to the wrist. One of the most well-known and verified benefits of reflexology is improvement in circulation throughout the body. This means more oxygen reaches vital organs, thereby optimizing their functioning and further increasing the metabolism. This also results in faster healing and re-growth of damaged cells. 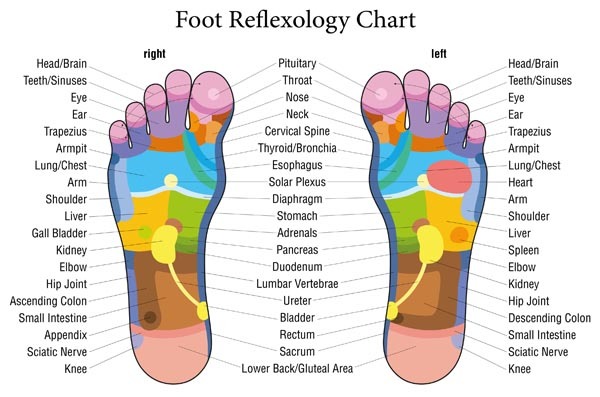 Reflexology can also be beneficial in restoring balance and harmony in the body and releasing tension. It can help to create a deep state of relaxation, calm the emotions, and produce a serene mind. Many people experience a profound sense of relaxation and increased energy following their session. Reflexology allows your body to achieve a level of equilibrium, putting it into an ideal state to tackle anything from major to minor health concerns. Here’s a quick reflexology routine you can do on yourself daily, or whenever you need a pick me up. Thumb walk the whole surface of your palm, all the way up to the base of the fingers. It doesn’t matter in which direction as long as you hit all of the different reflexes located in the hand. Do finger and thumb walking simultaneously all the way down each of your fingers, from tip to base. Gently finger walk between each of the metacarpals on the back of the hand. Gently finish with individual finger rotations, then clasp your hands again for wrist rotations. Blys is dedicating to making health and wellness services available to everyone. We’ve got a wide range of services on offer to ensure that everyone can find that thing that makes them feel better. If you’be been looking for a soothing pregnancy massage at home, Blys can connect you to local professionals. Stop trawling the web for “relax massage” and head to Blys – wellness delivered to your door.